Friend and Thinkwalks volunteer Nancy Botkin told me the other day that it’s strangely easy to change my mind about an “objective fact.” All you need to do is give me careful evidence of something that contradicts what I used to adamantly believe. I flip from saying I’m sure the Emperor was present to saying I’m not sure—or even that I was totally wrong. 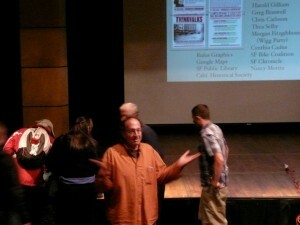 It’s not that I’m so easy to convince, but that information available is fuzzy and subject to interpretation. There! You’re prepped now with a relativistic haze casting doubt on the existence of Truth itself. That makes you fully ready for my confessions. Here’s the top stuff I’ve said that deceived The Public (you, me, etc.) on early tours. I’ve since found evidence of being so wrong. Untruth #1 Many streams in eastern SF flowed year-round at one time. Untruth #2 ‘San Souci’ (the creek, the valley) was from a family name. Untruth #3 The San Francisco Mission was founded at Camp and Albion. 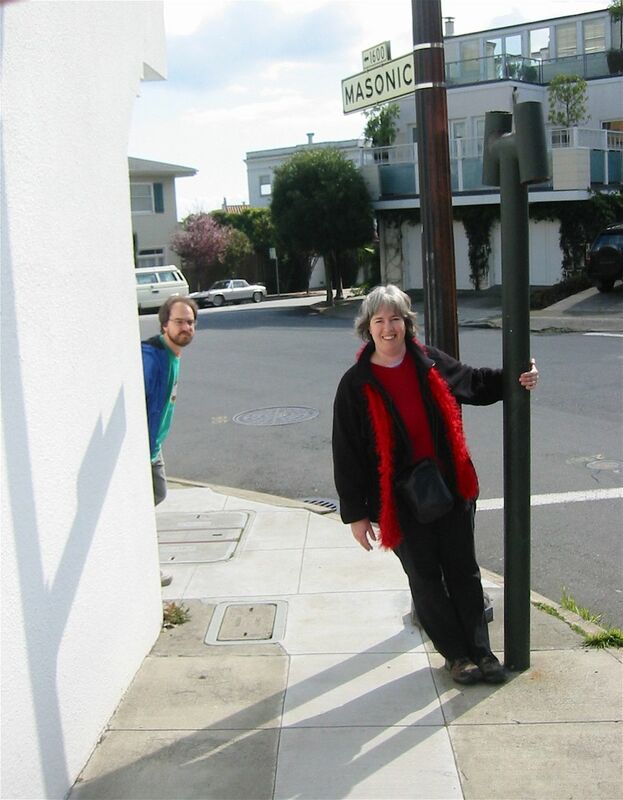 Untruth #4 Divisadero St. was named after the nearby watershed divide (Bay to the east, Pacific to the west). Untruth #5 Hayes Creek was never an actual surface flow. Untruth #6 The bison in Golden Gate Park were gifts to SF from Buffalo Bill’s Wild West show. Untruth #7 The scent added to odorless methane to make it easier to smell a leak comes from onions. 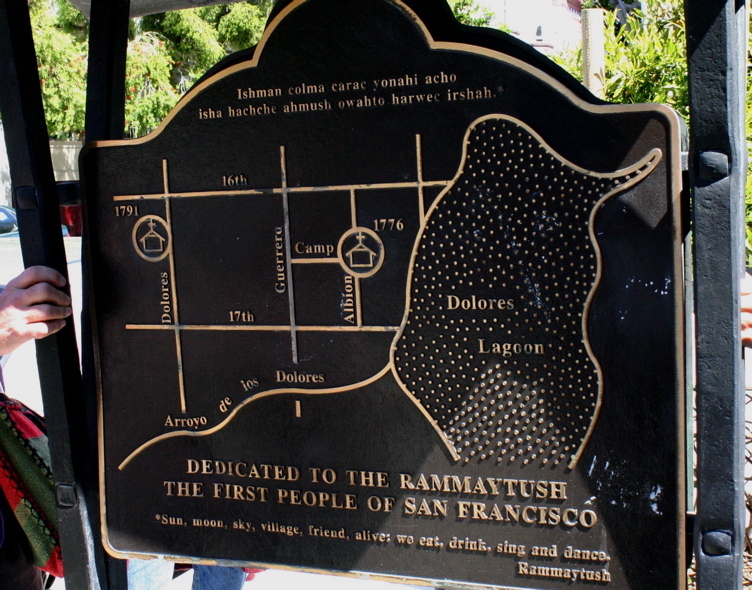 Untruth #8 Ramaytush is a language not a Ohlone Indian group name. Untruth #9 Candy-cane-shaped poles (and various other vent poles) sticking out of the sidewalk are vents from old wells. This is a classic vent pole shape, on the corner of 22nd & Church Streets, where Mona Caron's Botanical Mural is located. See Untruth #9. Below are my replacement untruths (or at least incomplete unknowables). #1 Other than in very wet years, it appears (from scarce early SF photos and maps with useful views) that San Souci Creek down 14th/15th Streets and the “Dolores” Creek down 18th Street may have been dry much of the time, though wet enough to redirect them into irrigation ditches. Mission Creek, itself a tidal lagoon, not a real creek, was probably sometimes just mud with a trickle. There’s much more to learn on this. If you’ve seen documents on it, show me! #2 It’s coincidence that there’s such a last name as ‘San Souci’. 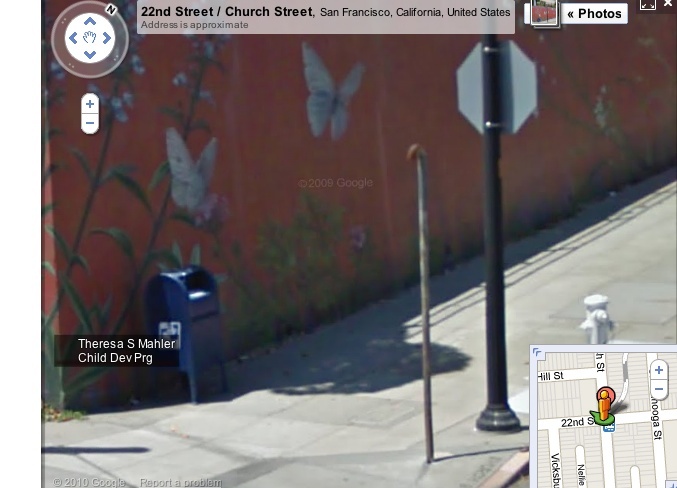 The valley (Lower Haight, Wiggle, Panhandle) was probably named after the way-station discussed in my previous post. #3 Despite the claims made on a bronze plaque at the corner of Camp and Albion Streets, there is little evidence of a lake in that location, and though the Mission was probably founded near there somewhere, it may have been more toward Duboce Park, or right where the Mission sits today. #4 There’s much better evidence that Divisadero was named using the Spanish term for ‘lookout point’ (same linguistic root as “visual”), although there are only sketchy stories as to why it’s called this. It likely relates to a hilltop nearby, but old maps are very hard to read as to the precise hill. #5 Maps from the mid 1800s show some ditches and possibly some intermittent flows from Hayes Valley across Market Street. It was most certainly a strong flow during the weeks of storms in the winter of 1861-62. At most other times, it was probably a trickle through muddy or sandy flats. And now it’s seeping through the soils. One of many poles I had convinced myself was from an old well. 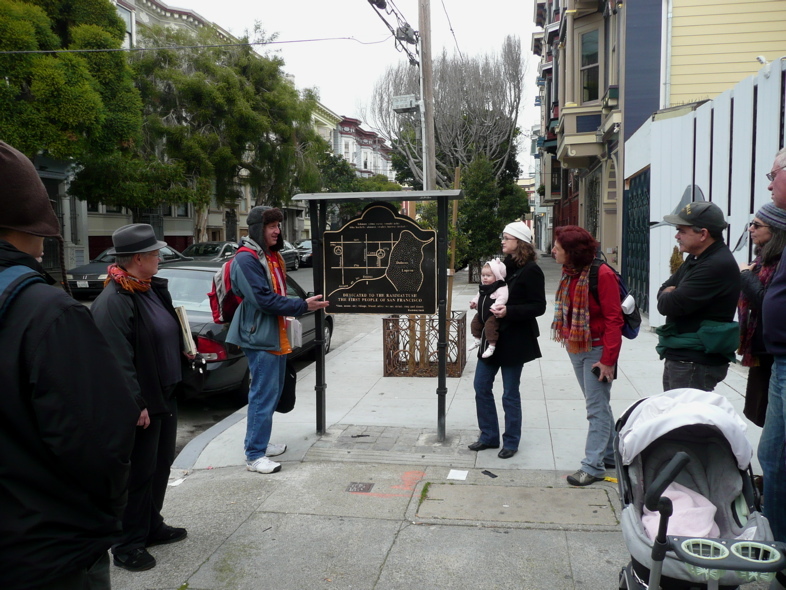 This one is at the very top of Masonic Street and immediately beside the headwaters springs of a stream that went south toward the Castro District and then down 18th Street into Mission Creek. #6 Stories of the first bison placed in the Park conflict on key points, but none of the reliable ones are about Buffalo Bill Cody. A girl bison, or cow, named Madame Sarah Bernhardt (after the notorious stage actor), and a bull called Ben Harrison (after the then President of the USA), were brought from the plains of Wyoming and Kansas, or Utah, along with a third and attempted fourth, fifth and sixth bison, depending which story you trust. The Paddock was moved from where the AIDS Grove is now. Some of the herd may be descended from Sarah. #7 The stinky scent released by onions is allyl mercaptan (C3H6S1), while the scent used to make methane odorous is methyl mercaptan (CH3SH). DIY: Chop an onion and put it in a jar in your fridge for two days undisturbed. When you open it, you’ll smell mercaptan. #8 Linguists group people by the way they speak. Yelamu Ohlone people in what’s now SF all spoke subset tongues of the Ramaytush language group, as did some other people in the region. As a result of this artificial grouping, many people now refer to the group of people who spoke those tongues by the language name. That usage created a meaning that represents a discernible group. #9 It seems most of the vent poles are associated with subsurface PG&E utility vaults nearby. Others are still a mystery, but city employee Greg Braswell, who knows far more than anyone else I’ve met about the details of streets, doesn’t think they’re from wells. If you find one that’s not near a PG&E-marked metal cover, let me know and I’ll investigate. Since learning about the past is tricky enough with all the interested parties convincing themselves of some version of events, and other versions being invented by chance, I came to realize how silly it is to stick to a story in the face of evidence. I mean, c’mon! The things we tell and believe are never entirely reliable, even when we think we have first-hand knowledge. It’s yet another reason to come on a tour you’ve been on once before!